Last Thursday I saw on Twitter that Odette Toilette had a last minute spot available on her day trip to the Osmotheque Perfume Museum and Conservatory. I messaged her straight away and took the place. Exciting! 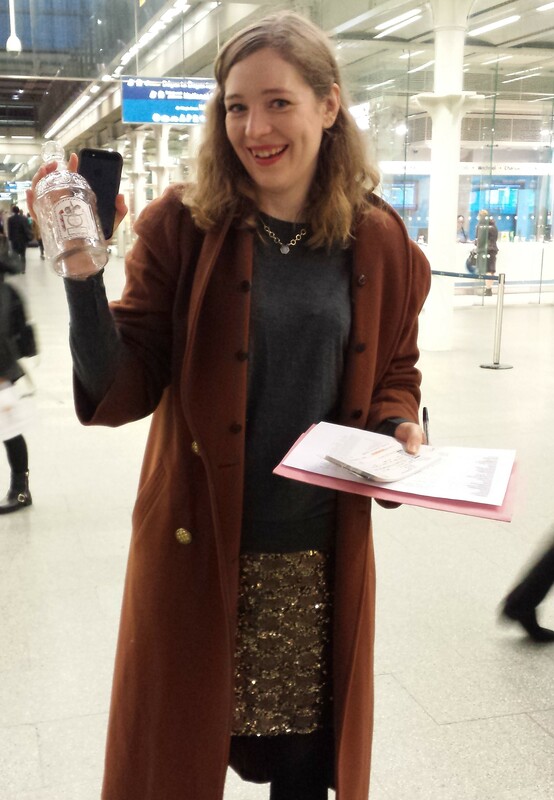 Therefore, (not so) bright and very early on Monday (6.30am) I joined about 20 other fragrance fanatics to board the Eurostar at St. Pancras International in London. Odette was concerned her sequined skirt looked a little “walk of shame” at that time in the morning but I thought she looked great. 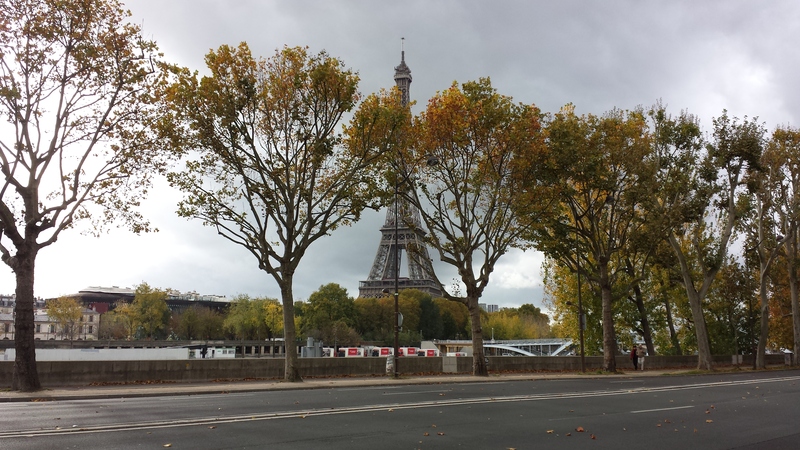 The roughly two and a half hour journey went surprisingly quickly and there was a coach to meet us at the Gare du Nord. 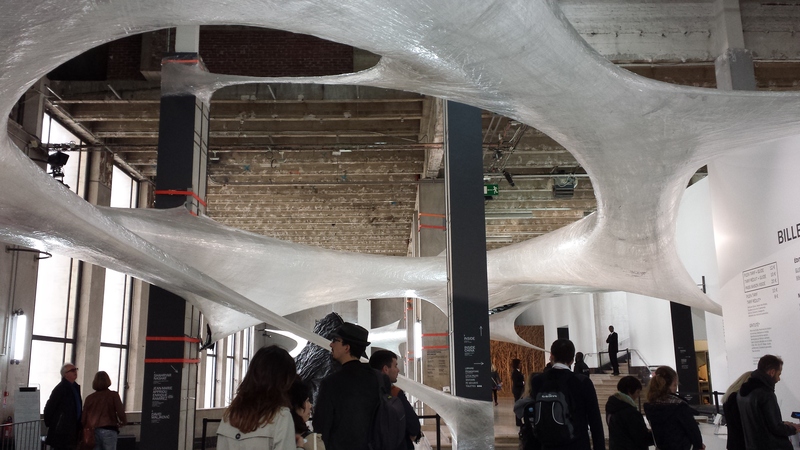 We set off for lunch at a restaurant based inside an art gallery just across from the Seine. The meal proved interesting. We had to pick our courses in advance but there was some confusion over the French translation. At about one o’clock we boarded the coach again to take us to the Osmotheque which is in Versailles (home of the Palace) about half an hour outside Paris. Odette had warned us in advance not to expect a visual spectacle but we were so hyped up we soaked up everything including the books, bottles and raw materials on display. 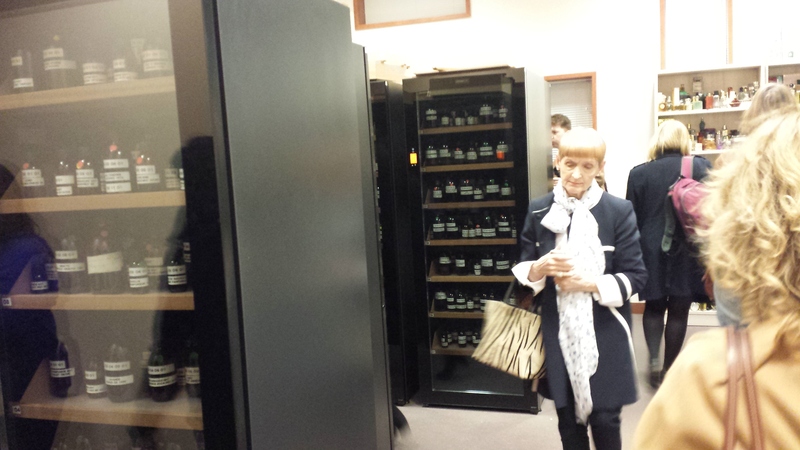 We then went thorough to a lecture room where Patou perfumer and Osmotheque curator, Thomas Fontaine, took us through around 30 vintage perfumes. Thomas was nothing short of wonderful. He was extremely open about his profession and in touch with the sensual side of perfume. First we watched a short film about the Osmotheque, which has been conserving fragrances for the last 25 years. Afterwards Thomas gave us a brief introduction to perfumery through the ages and then the sniffing commenced in earnest. We each had a holder of little envelopes in which to slip the paper strips with perfume that were handed around so we could experience the drydown later. Thomas told us a little about each one with a screen showing factual information and pictures of the bottles. Now I hope M. Fontaine will forgive me for mangling his words but the following will give you an idea about some of what he said. Thomas: This fragrance features citrus notes but it is also very spicy. Clove and cinnamon are known for their anti-bacterial properties so this eau de toilette was used to help people keep clean. Thomas: Legend has it that in the Middle Ages at a time of disease thieves were stealing and not getting infected. The police asked them how this was so and they claimed it was a fragrance of spices suspended in vinegar. At the time this fragrance was launched there was not much of a distinction between perfumers and pharmacists. Many pharmacists created perfumes for medicinal purposes. They were using naturals but when synthetics were developed this opened up whole new ideas. The first important new molecule was coumarin which was first synthesised in 1868 and many more followed such as vanillin, ionones, synthetic musks, aldehydes, linalool and more recently, ambrox. Thomas: This is 50% coumarin and a new accord was created – the fougère. Group member: It’s woodier and less soapy than the current version. Thomas: Well, you could re-create it the same as this version but you couldn’t sell it because of IFRA and EU regulations. They are becoming more restrictive and it’s becoming harder and harder for perfumers. We came close to not being able to use any natural rose and jasmine recently because they contain allergens for 0.2% of the population. We are not such a big lobby as the cigarette manufacturers. In France 70,000 people a year die from smoking but this product is still on the market. 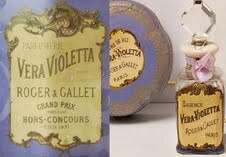 Thomas: This was created by Aimé Guerlain and is an example of vanillin and coumarin. A lot of men love it, I even wear Jicky. 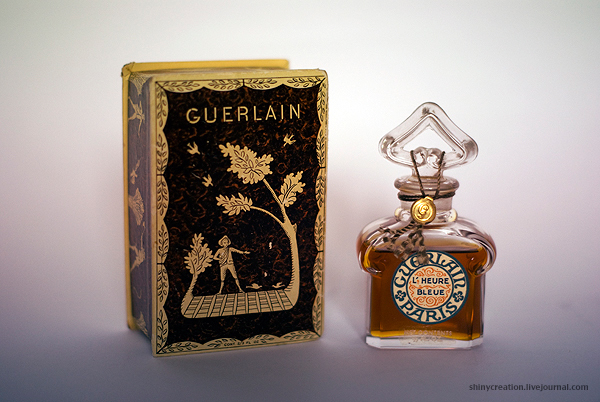 Guerlain went on to create a similar fragrance called Mouchoir de Monsieur. Thomas: This means “Real Violet”. It was the fist fragrance to use the new molecule, ionone to recreate the smell of violets. Group member: It’s very carrot-y/iris-y. Thomas: In iris you can smell a violet element. But using ionones is a lot cheaper than using orris root which is the most expensive natural in the world. Synthetics made fragrances easy to read. Naturals need synthetics to develop and synthetics need naturals to add richness. Thomas: This has a lot of narcisse and some tuberose. The modern version has more tuberose, which is cheaper. Thomas: Francois Coty introduced sensuality into perfume. 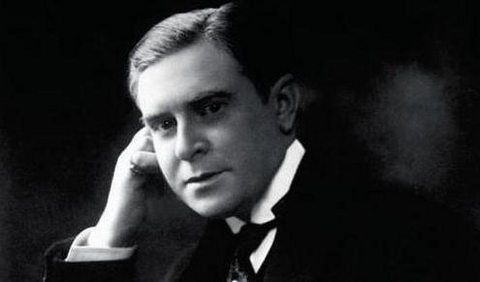 He created a company at the beginning of the twentieth century which revolutionised the industry. He created so many new and important fragrance families including ambers and chypres. New techniques of extraction were developed also at this time. Extraction using solvents to create absolutes replaced enfleurage. Perfumes were still copies of nature however. Abstraction didn’t come till later with perfumes like Chanel No.5. There were a lot of soliflores on the market. Thomas: An amber accord was created using vanillin and labdanum. The vanilla contributed sweetness and the labdanum contributed warmth. This inspired new fragrances such as Shalimar which added bergamot and Habanita which added vetiver. So the accord is developing with each new creation. Thomas: The benzyl acetate here adds fruitiness. Group member: Can you recreate the very old perfumes and sell them today? Thomas: Take for example Black Jade which I created for Lubin. It was inspired by Marie-Antoinette’s fragrance. But of course it doesn’t smell like Marie Antoinette’s fragrance. We have the formula. If it did, no one would wear it. We have to create a fragrance that will sell and make money so we create a commercial interpretation. Although I don’t like the word “commercial”. 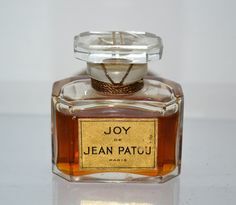 You don’t have to make a perfume appeal to the mainstream for Lubin and Patou. You just need some people to love it. When you make a perfume for Proctor and Gamble it has to sell thousands and thousands, probably more. 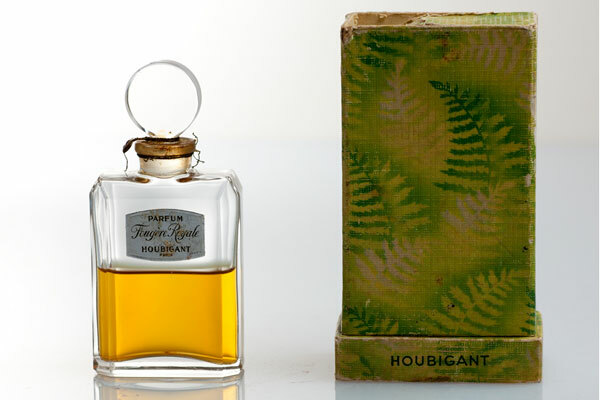 Thomas: L’Heure Bleue uses orange flower and jasmine alongside coumarin. 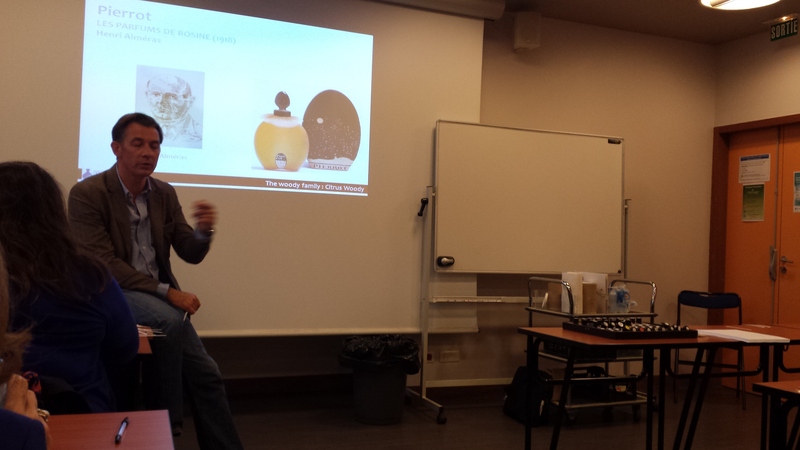 Thomas: Paul Poiret was the first fashion designer to link perfume with fashion. However, he didn’t put his name on the bottles but used his daughter’s name, Rosine, instead. This is very spicy with clove and cinnamon but also has fruity accords like peach. Thomas: We are animals so we like animalics – except maybe the Americans! Jicky used 1-2% civet. We use cumin because it smells like sweat and we use costus because it smells of hair. We are all driven by odours. Thomas: Named after the island of Cyprus. It has cistus labdanum, bergamot, rose and oakmoss. For me, the chypre is one of the most sensual accords. Thomas: Cigars used to be impregnated with civet and most of the tobacco shops in France were called “Civet” . Tabac Blond combined narcisse and civet. One woman who tried this said to me “It smells of my grandmother”. This wasn’t because her grandmother wasn’t clean but because it reminded her of her grandmother’s furs. Thomas: In the twenties more raw materials were available from across the globe, from places such as China and the Middle East. Thomas: Chanel No.5 was the first perfume to use such a large amount of aldehydes. 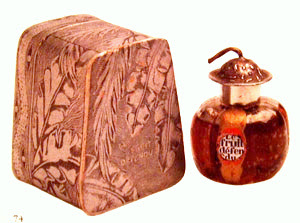 It created a new genre of fragrance – the floral aldehyde. Arpége came along a few years later using the same accord. 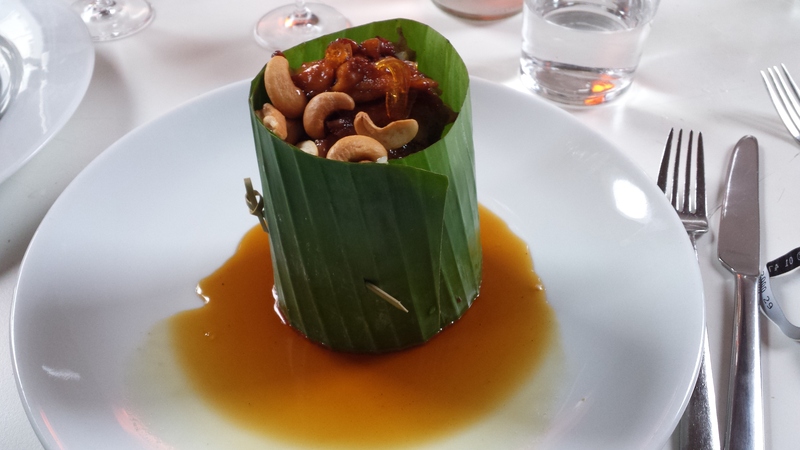 Thomas: This was originally intended as a gift for Patou’s special clients. The perfumer thought it would be impossible to produce because of the expense of his formula which had a 80-90% mixture of rose and jasmine. I smell it nearly everyday and it changes. It has perfect balance. Considering the cost of the raw materials it’s the best value for money perfume on the market today. Maybe one day we will have to make a big stand against IFRA and the EU regulations because every year there are new restrictions and every year we have to reformulate. It’s a big mess because there are different regulations in the US and Japan but the European rules are the most strict. We left the lecture room and had a look around the vault where they keep the perfumes in dark brown bottles in fridges with Argon gas to aid preservation. Before leaving, quite a few people bought copies of the Osmotheque fragrance classification book “Classification des Parfums et Terminolgie”. Then it was time to head back to the station to catch the 7.13pm Eurostar home. It was delayed, but once onboard, Odette passed around paper strips with the perfume each person had requested ahead of the trip. Nick Gilbert got Snuff by Schiaperelli, Katie Puckrik chose vintage Chloe and some others went for long extinct Guerlains. Being a late-comer I didn’t get to choose one but this was the only disappointment of an otherwise truly amazing trip. Odette opened a couple of bottles of Champagne to celebrate our fantastic day out. Would you like to visit the Osmotheque? 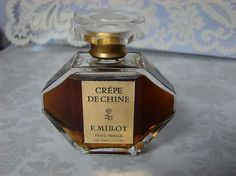 What fragrance would you love to smell in vintage form? This entry was posted in By Tara, Travels and tagged Caron, Coty, Fragrance, Guerlain, Houbigant, Lanvin, Lubin, Osmothèque, Paris, Patou, Perfume, Thomas Fontaine, Versailles. Bookmark the permalink. Ok – trying not to hyperventilate – must breath…Wow wow wow…. I’m going to go back over your report in more detail Tara, this sounds wonderful! What a gorgeous day you all must have had. Excellent!! Thanks for writing it up and sharing. Thanks, Tina. It’s a rather long report, so I’m glad you are happy to read it in detail. It was a wonderful day and yes, you really have to try and sniff as much as humanly possible if you go. Actually, Tabac Blond would be high on my list. Tabac Blond was glorious – the perfect tobacco. So smooth. I wish I owned some. You know we really must be scent twins Val because those two were my favourites. I would go back in a heartbeat. Sandra, you really must make plans to go at some point. You’d love it. Isn’t the Osmo amazing Tara!!! Ambre Antique and Chypre were an absolute revelation to me. Who could guess that something like AA, created over a century ago, could smell so contemporary. Some of the early Coty’s and Iris Gris could be released by a niche house now and the term “old fashioned” wouldn’t even come to mind. I’m so thrilled that you got to experience this with such a great group of fragrance people. I only wish I could have been there. Michael, it really, really is! So much fun to go in a large group but going with just one other person like you did with Portia would be fantastic too. You can totally monopolise the perfumer then, ha ha. Chypre was particularly stunning and it had an amazing vanilla drydown later on. V, I just couldn’t resist a little dig. And may I say it again: Ha! I can’t be said enough! HA! I had exactly the same thought when I read that part (before seeing your comment, B.)! And you know what? Since then I haven’t used or even tried a single perfume from the brand. Thanks, V! It was truly amazing. The vintage Narcisse Noir is not scary at all. I’m so pleased he mentioned that about Black Jade. Too brilliant. Couldn’t wait to write it up for B. A huge thank you for reporting, Tara ! Thanks for reading! If you can ever make the time, you really must go. Great write up, Tara. I hope to go there next year, but I can totally see the appeal of having 20 other lovely nerds with you to share the experience. 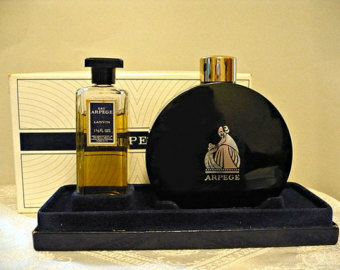 And I did ask myself which vintage perfume I would have gone for….not easy, but probably Shocking, or the Arpege. Thanks, Sabine. You’ll have a blast if you go next year. I hope it happens. Going in a group certainly makes it cheaper, apart from anything else! Putting this one on my bucket list. Would love to try all of them but more especially my favourite L’heure Bleue. Wow, wow, wow! You’re most welcome! I’m glad it’s on your bucket list. It’s a must-visit for perfume lovers. L’Heure Bleue in its current parfum form is still pretty amazing. OMG – fabulous and so cool to go with a like minded bunch of fragrance obsessives! I have had this on my must visit list for 6 months now and I still haven’t managed to get there. It really was fun going in a big group. It was like a school trip! I hope you manage to get there over the next 6 months. What a fascinating experience! There are very few places that inspire such a sense of anticipation in me…I have just informed my husband that our next holiday includes a stop at the Osmotheque. The old Guerlains call to me, maybe Djedi. I’m glad you’ve decided to include a visit to The Osmotheque in your next holiday Jackie b. It’s not cheap but ‘m sure you won’t be disappointed if you book a session with a perfumer. Djedi is a great choice. Djedi is stunning…..a must for any Guerlainophile. Tara, did they have ’30s version of Vol de Nuit? Tina, I don’t know but I wouldn’t be surprised if they did. The others got a list of everything available and apprently there was pages and pages. I wonder which perfume you would have chosen? I’m not sure myself since most of my Guerlain-curiosity has been satisfied, to the sniffing extend at least. Coty l’ origan is still high on my list. I even won a sample, but it was never shipped 😦 and also I’m curious as to what a fresh Diorissimo in original formulation would smell like, since apparently it doesn’t age well. Too bad you didn’t get your L’Origan sample but hopefully you will experience it at The Osmotheque one day. I would have picked Iris Gris. It’s great that you’ve already got to try so many vintage Guerlains. I couldn’t believe how much like Shalimar Jicky used to be. Not overloaded with lavender like it is now. I would love to visit it! Your trip sounds amazing! Thanks so much for sharing it. 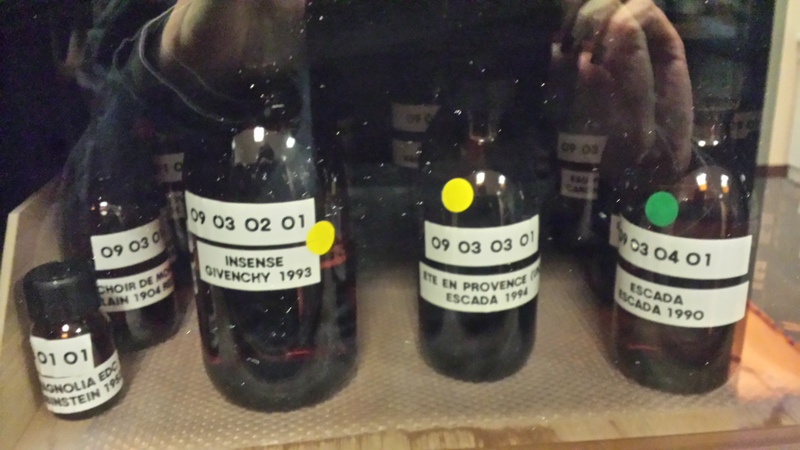 And the pictures of the bottles – most of them were just so beautiful. 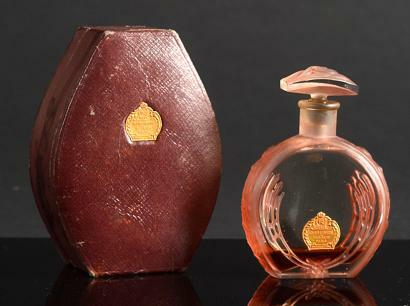 I would be at a loss as to which vintage perfume I’d like to try, maybe Ambre Antique. Thanks again for the great review! I’m glad you enjoyed it, Kandice. Many thanks to Birgit for including all those gorgeous pictures of the original bottles. I agree, they’re so beautiful. Ambre Antique was a big hit. Thank you for the formidable résumé, Tara, I enjoyed the pictures, the reading and to fantasize about having been to this exciting trip, too! Seems like perfumista heaven. I would love to smell everything of course, but Vold de Nuit in vintage form comes to my mind since I tested it today for the 100th time and can’t make up my mind if it’ll get on my christmas wish-list and if yes, in which concentration. (Hm, but if I ever had the chance to smell the original version, I wouldn’t probably enjoy the current one? The big stand against IFRA and EU is a good idea!). I love pre-reform/vintage VdN but haven’t tried the current version lately. If it’s Guerlain, I’d say go for the parfum. I think The Osmotheque should lead the revolution against the IFRA/EU regulations! Tara, I really enjoyed reading your report (as always!) and I’d love to go there one day but I don’t have any “vintage desires.” I’m more curious about older perfumes in general than about any specific one in particular. Is iris root really the most expensive ingredient? It’s hard to believe that a renewable and reproducible element (it doesn’t matter how long it takes – it’s doable) might be more expensive than sporadically found ambergris or rarely occurring agarwood. 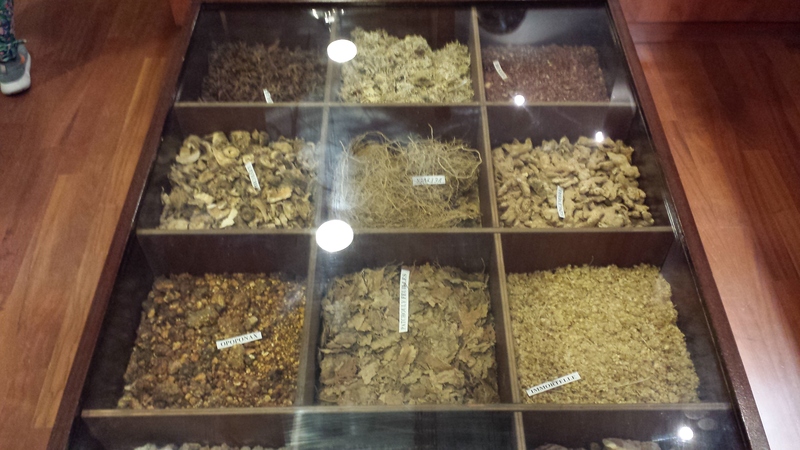 Maybe orris root is the most expensive raw material that can be produced? 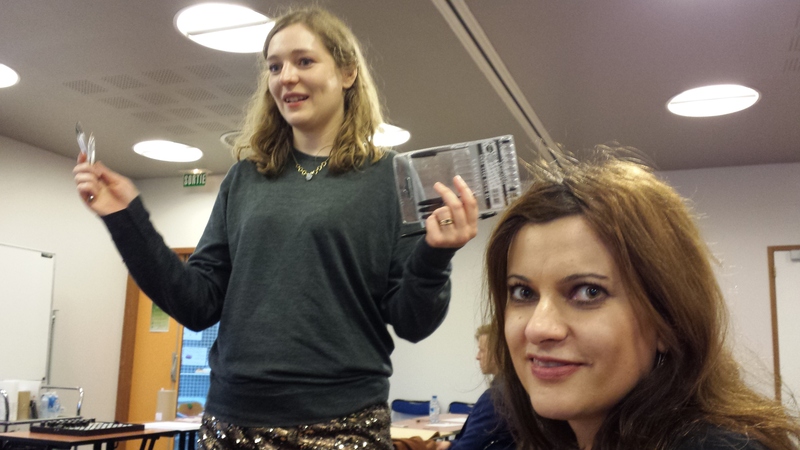 Ines, I think a few people were bewildered with the choice! I’m sure you’ll get to The Osmotheque one day. Your report makes me even more excited to visit Osmotheque! 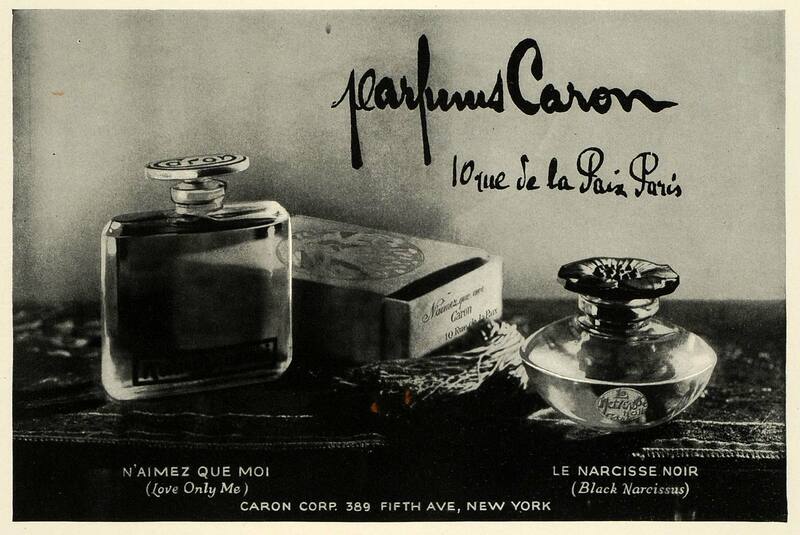 I really would love to smell Narcisse Noir because narcissus is a very fascinating note for me and to smell the vintage accord would be inspiring. Beckie, it’s exciting for visitors and it’s good for the Osmo too because it helps fund their work and spreads the message of what they’re doing. Vintage Narcisse Noir was fascinating – quite earthy. Tara, a visit to the Osmotheque would be mind blowing. I’m so happy you had the opportunity and took it – and in the wonderful way that you always do, you brought us along with you. Merci! 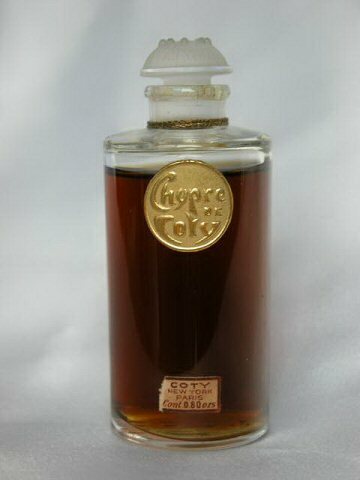 I was luck to purchase a bottle of vintage Coty Ambre Antique on Ebay when I first started collecting perfumes. I think my bottle was from the 40s (that’s what I judged it to be looking at old bottles on the Internet). It was quite good, but what I would really love to smell if I had the chance is the vintage Patou 1000 and the Caron Tabac Blond. 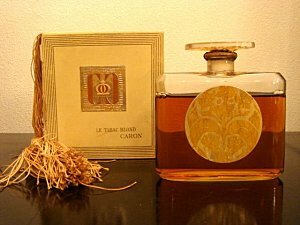 I actually am one of the few people who think that the current Tabac Blond in the extrait form is really really good stuff, but man, I’d love to smell the version you smelled! Thanks Suzanne. I’m so glad I went for it. I’m currently stalking some vintage Tabac Blond on ebay because I was so taken with it, but I’m very happy to hear you think the current extrait is really good. I shall investigate! Oh Tara, thank you so much for this account of your truly intriguing day! I am equal parts jealous and in awe 😉 I’m glad you had a good time! Thanks, Thomas! It was fascinating. I wish you could have come along with us. Thank you so much for this amazing post, I loved it. Needless to say I would have loved to be there with you guys. I and hundreds of thousands (per petitions) online if people would absolutely love New West brought back. It has long been the best scent exception!!! !